This is another great perspective piece from artist David Story. This outstanding sketch includes some interesting notes he has made in the margin. The art captures an image of 1915 Indianapolis 500 winner Ralph DePalma and his Mercedes racer. 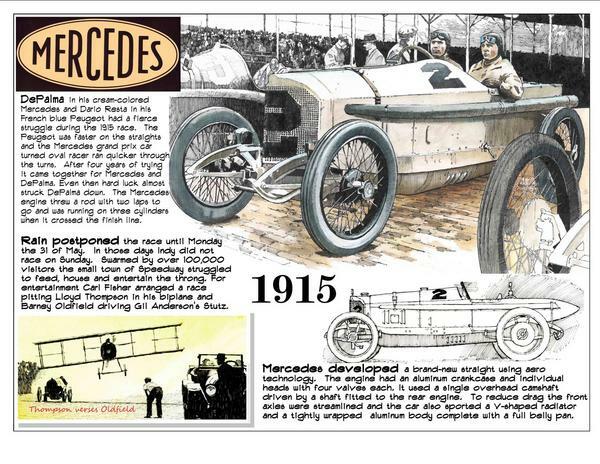 This race marked the third year in a row that a European manufacturer, this time a German one, dominated America's new premiere race. One big difference though was that this was also the first time that a privately-entered car won the great classic - previously all had been manufacturer entries. The owner, E.C. Patterson was a sportsman and, at the time, vice-president of the successful Collier's Magazine. Patterson later that year on July 13 set a new time record for an automobile trip between Chicago and New York in 35 hours and 43 minutes. As for the "500" it was originally scheduled for May 29 but solid rain the previous four days had flooded the creek at the south end of the Indianapolis Motor Speedway as well as low spots in the roads leading to the grand facility. With tens of thousands of out-of-town visitors on hand for the big race Speedway management prevailed upon famed barnstormer Barney Oldfield to stage a match race against pioneering aviator DeLloyd "Dutch" Thompson in his bi-plane. This was an act Oldfield was well accustomed with and had created a lucrative traveling show with another aviator Lincoln Beachey in 1913. When race time did come the event did not disappoint. DePalma and rookie Italian-born English driver Dario Resta staged a hammer-and-tongs duel until Resta pulled away to lead by as much as a lap. A blown tire sent him into a brush with the concrete wall in turn four. While Resta continued on his Peugeot was never quite the same with a bent steering arm that made it nearly impossible to handle. Resta fought with a car that by race end drained him every ounce of strength in his arms. DePalma steadily pulled away but with three laps to go the seemingly unthinkable happened - just as in 1912 when he was robbed of certain victory when a broken connecting rod thrashed the life out of his engine, the same thing happened. DePalma nursed his wounded beast to the finish line as the flailing rod hammered out two holes to escape the cylinder that encased it. Amazingly the engine had just enough power to hold together and still secure a victory of over three minutes margin. An exhausted Resta was second with Norwegian Gil Andersen third in an Indianapolis-built Stutz. Immediately following the race DePalma drove his stricken machine to its private garage at the track. The machine had been modified by Jesse Vincent, chief engineer for Packard and the team may have wanted to keep those changes out of sight from nosy competitors. Look for more sketches from David Story here in a special collaboration with First Super Speedway. 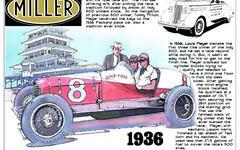 Take a look at his sketches of other Indianapolis 500 champions Joe Dawson, Jules Goux, Rene Thomas and Ray Harroun.